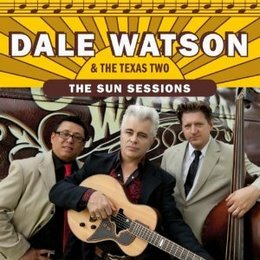 On his new release Texas country music traditionalist Dale Watson goes back to the roots of by recording in the historic Sun Studios of Memphis, TN. It was here that owner and chief producer Sam Phillips changed the face of 20th century music by manning the board for the likes Johnny Cash, Elvis Presley, Carl Perkins, Roy Orbison, Charlie Feathers, Ray Harris, B.B. King, Joe Hill Louis, Rufus Thomas, and Howlin’ Wolf, Charlie Rich, and Jerry Lee Lewis among many others. Dale scales down his band for the sessions to drummer Mike Bernal and Chris Crepps on upright bass, or as they have been christened the “Texas Two.” This band title is not the only testimonial to Johnny Cash’s 1954 to1958 sessions with his Tennessee Two.” The spirit of Cash is also evoked on nearly every song with the use of his trademark boom-chicka-boom sound as well as the class atmospheric “slap-back” production that helped make the Sun Studios famous. This is not the first time Dale has gone to hallowed ground to summon the spirit of Cash. His 2007 album, from the Cradle to the Grave was recorded in a cabin near Nashville formally owned by Cash and graciously loaned to him by his friend and current owner Johnny Knoxville of Jackass fame. Wason and his Texas Two peer from the cover with the iconic beaming sun set above them. These days Watson is looking less like Paulie Walnuts from the Sopranos and more like an older Unknown Hinson. Also in line with Cash’s Sun Studio sessions is each songs brief duration. The 14 songs here clock in at less than a half-hour overall with the longest song, an ode to love and Southern cooking My Baby Makes Me Gravy, at 2:45. A way to a man’s heart is through his stomach but apparently it doesn’t take long to get there. The genesis of the album began on Watson’s 16-ton Eagle tour bus bus after learning that the gig they were headed to in Memphis had fallen through. He then called up Sun Studios to see if they had an opening and they said “Come on in.” Watson then used his iPhone to record his voice as he worked out some songs while sitting behind the wheel. Down, Down, Down, Down sets the pace with a boom-chicka-boom fright-train-like opening as Watson’s baritone breaks down a song of a life misspent on woe, sorrow and hell-raising ultimately asking for redemption. The Cash vibe is strong on Johnny at the Door, a tribute to a “good ol boy” Austin-area bar doorman and Drive, Drive, Drive that often echos Cash’s own Cry, Cry, Cry. Elbow Grease, Spackle And Pine- Sol is a guide to man’s reaction to being served divorce papers by his wife through aggression, he apologizes but sound like he does it with a smirk and doesn’t sound like he’s sorry at all for the “holes in the wall.” Her Love has Watson conjuring one of the other ghosts of Sun Studio. The sentimental , heartfelt ballad has the mark of Elvis Presley running all through it. Watson continues to be the cure for the contagion of Music City pop-country. Be sure to check out the Facebook campaign to get Dale Watson on the legendary Austin City limits show. Where has creativity gone today? Albums the shorter the better, looks from ages long gone are hip and the music exactly like it was 50/60 years ago. Or: Has Johnny Cash restarted breathing or what?